There is some question as to whether this photo is actually Javan Harrell or Charles Edward Harrell. However after studding later photos of Charles, and not finding matching facial features, I believe it is most likely Javan. It was found in a dilapidated storage shed on the Drivers Virginia homestead of Charles Edward Harrell in 1997 by Charles Thomas Harrell. Attached to the frame was the word Father. Javan Harrell enlisted in Feb. 1862 into Co. E, 33rd NC Inf. regiment, when Burnside's expedition to Eastern NC was in full swing. It was Burnside's advance on New Bern that was their first battle. His company was the only company with the Enfield Rifles, imported from England in the entire regiment at that time. He was in the battle at New Bern NC in March 1862, and at Seven Pines/Fair Oaks Va. in the Penisular campaign in June 1862. He was captured and held on the prisoner ship USS Coatzacolcos before being paroled. He remained at home AWOL for the remainder of the war. A good concise listing of his service can be found in NC Troops, Vol. for the 33rd NC. In 1910 he was living in Franklin VA. Defrosa and Javan's wedding was performed by J.S. Wallace in Portsmouth VA. soldier in 33rd NC, Co. E from Jan. 15 1862 until reported AWOL in Oct. 1862. Married while at home in Gates Co. during the war Living in house on 403 Highland Ave., Suffolk in 1923. We have modern picture Information from Suffolk City Directory. Javan Harrell: From NC Troops, 1861-1865, Co. E, 33rd NC Inf. he Resided in Gates Co., where he enlisted on January 15, 1862. Present or accounted for until captured at or near Frayser's Farm, Va., June 30, 1862. Paroled and exchanged prior to November 1, 1862. Reported absent without leave through December 1863. Dropped from the rolls of the Company in January-February 1864, for protacted absence without leave. Married in Gates Co. during the war. Was a farm laborer in the 1870s but later became a farmer, then by 1910. His death certificate was found on Reel 126 of the Death records in the Library of Virginia, #730-1326. It states his address in 1924 as 423 Highland Ave. Suffolk, wife Defrossa Harrell, born 1847, in Gates Co., NC, age 77, retired. His parents are listed as Mr. William Harrell (b. Gates Co., NC) and Mrs. Bettie Harrell (b. Gates Co., NC). Informant was Mr. B.F. Harrell of Greensboro, NC. Javan died of Cardio Ruial trouble as reported by Dr. J.L. Rawl. 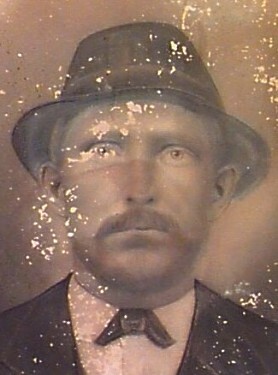 He was buried in Cedar Hill Cemetery on Jan. 15, 1924, undertaker F.D. Hill of Suffolk.